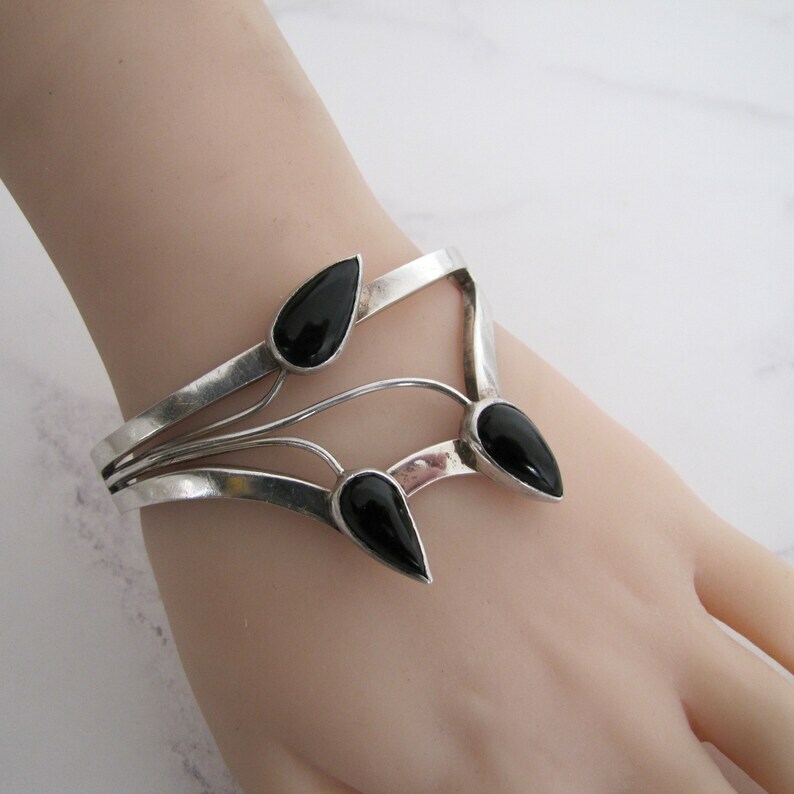 Beautiful vintage Mexican silver hinged cuff bangle that is reminiscent of Art Nouveau design with a graceful stylized flower set with teardrop shaped onyx flower heads. The bracelet can be worn with the flower pointing up or down, hinged at the side and it opens and closes by pushing in at the notch. Crafted on the oval, this is a heavy solid (not hollow) bracelet, big and bold, a real statement piece, just gorgeous! MATERIALS: 925 Sterling silver, natural onyx. MEASUREMENTS: The front measures 1-3/4" high sloping to 3/4" at the back (approx. 45x20mm). Inside circumference 8 inches (20cm) around. Diameter 2-3/8" (6cm) side to side, 1-7/8" (5cm) front to back. HALLMARKS: Stamped on the inside "TL17" "Mexico" & "925"
CONDITION: Superb condition with no chipping to the stones and the catch and hinge in perfect working order. Browse more exceptional fine and costume jewelry from every era - Georgian - Victorian - Edwardian - Art Deco - Modern - at mercymadge.etsy.com - With new arrivals added to our shop daily we offer an interest free layaway plan as well as a no risk guarantee. Your purchase will arrive gift wrapped in a Mercy Madge! box. Perfect for giving or safekeeping! No need to purchase this! All of our items are packaged in our top quality custom jewellery boxes and coordinated wrapping. All ready to gift! Art Deco Sterling Silver Amethyst Bracelet. 1940s Tank Bracelet. Taxco Mexico Silver Bracelet. Vintage Retro Moderne Mexican Jewelry. Mexican Mid Century Sterling Silver Emerald Green Bracelet. Gerardo Lopez, Modernist Silver Bracelet, Taxco Mexico. 1950s Eagle Mark 26. Vintage Taxco Silver Agate Pendant. Mahogany Jasper Necklace Pendant, CII Mexico Sterling Silver Pendant Brooch. A beautiful ring, which I ordered with along with another item. Everything arrived *beautifully* packaged. Sharon was so charming and helpful with my pre- purchase questions. Highly recommended! Antique Victorian Wax Seal. Bronze Desk Seal. Young African Boy Bust Sculpture. Initials EMB Monogram, Sealing Wax Desk Stamp. I absolutely love it is amazing! Items in original condition may be returned for any reason. Notification of return should be made within 3 days of receipt and item returned within 7 days. Buyer pays return shipping costs. After 3 calendar days all sales should be considered final. The full mailing address for returns can be found on your printed receipt inside your package. Returns will be accepted as long as the item has not been altered or damaged. Tracking and/or insurance is recommended as items lost or damaged in transit cannot be refunded. Additional instructions for INTERNATIONAL NON-EU RETURNS - Return the item in its original packaging with the UK CN22 or CN23 customs form showing. If alternative packaging is used detach the original UK customs form and attach it to the outside of your package in a prominent position. Clearly mark the package and/or your own country's customs form " Returned Goods ". Any UK customs charges incurred by not following these instructions will be deducted from the refunded amount. Upon receipt of the returned item, a refund of your purchase price, minus original shipping, will be issued within 48 hours. Items ordered from us that are refused at delivery or returned to us as unclaimed or undeliverable will be issued a store credit for the purchase price minus original shipping. We work hard to get your package out to you within 1 business day and we will email you with the tracking link and carrier details as soon as it is dispatched, typically we use the Royal Mail or Fedex. Outside the UK: 5-15 business days. *****Please monitor the progress of your package and notify us in a timely manner if it does not arrive as scheduled. Every purchase will arrive boxed in our complimentary custom packaging which is free of charge. Items returned within our return policy are not subject to a restocking fee. If an item is returned outside the shops return policy then we reserve the right to charge a discretionary 20% restocking fee. Antique jewellery, by its very nature, is more fragile than modern jewellery and can be more prone to damage. Many of our pieces are 150 years old or more, it is part of their charm and they will require special care. We guarantee all our items as described but can not guarantee they won't need maintenance or repair due to use and wear. With a modicum of care, the jewelry you are fond of can last many more lifetimes to come. We accept no responsibility for pieces that become damaged whilst in your possession and such damaged items cannot be returned. With literally thousands of online sales under our belt we are accomplished international shippers. We ship worldwide and will dispatch your order with tracking within one business day of ordering. Your highly anticipated purchase will arrive quickly and be beautifully gift wrapped and safely packaged to boot. Global express shipping upgrades are available at checkout too should you need it even faster. We are unable to show our entire collection in our Etsy shop so if you are looking for something that we don't have please feel free to contact us by email, phone or through our website. We have many more items in stock than are listed and may have the perfect piece. However, we do not make custom/bespoke jewelry to order, our focus is purely on preowned vintage and antique. We do our utmost to accurately date and describe our jewelry. We use a variety of techniques, testing and observation. All precious metals are tested whether hallmarked or not. We use electronic testing equipment (Auracle & Misar) and acid testing. Colored gemstones are tested with the Presidium Duo Tester and diamonds with the Diamond Selector II. We use industry standard gauges and digital calipers for measuring gemstones. When we have jewelry appraised we use independent gemologists and appraisers who have no vested interest in the value of our inventory.